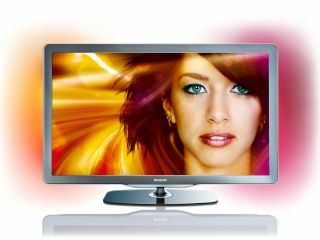 Philips has announced the arrival of its 7605 LED TV range in the UK, which brings LED technology to mid-range users. Available in 32, 37, 40 and 46-inch sizes, the telly is packing a number of interesting features including the company's famed Ambilight technology, a contrast ratio of 500,000:1 and something called Pixel Precise HD picture processing. Because the 7605 series is all about LED it's much more eco-friendly, with Philips noting that the 7605 uses 40 per cent less power than a standard LCD panel. For those who want to access the web through their telly, the 7605 also has this functionality but as an optional extra. If you want all the NetTV functionality and the ability to stream music, pictures and movies from any computer to the screen, then you can with an optional wireless dongle, which will cost £49.99. The Philips 7605 LED TV is out now in the UK, with pricing ranging from £849 to £1499 - which should be enough to whet your apetite before Philips' inevitable launch of a 3D TV at IFA 2010.